Quintic Ball Roll utilises a high-speed camera (360 – 1080 frames per second) to track the putter and golf ball throughout the impact zone of either a right handed or left handed player. 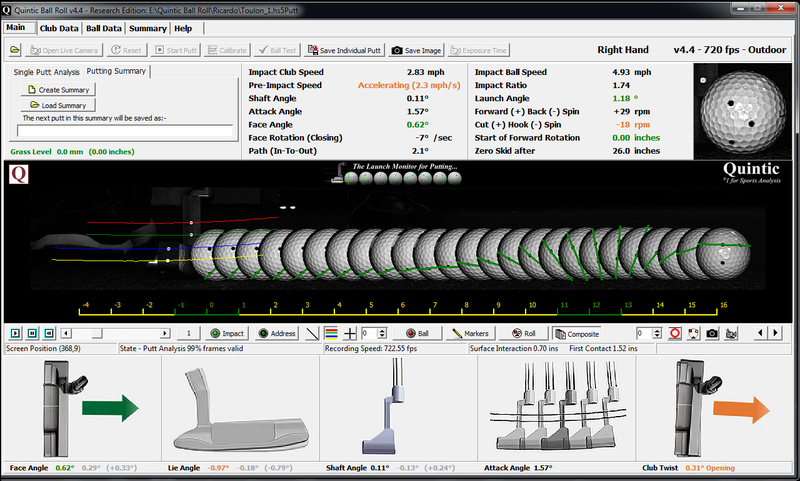 The system automatically measures over 45 parameters regarding the putter and ball, both graphically and numerically. The data is instantly displayed within the software for immediate analysis, review and intervention. Quintic Ball Roll v2.4 (Ball Only) System – Specialises in the golf ball performance during impact, capturing at 360 frames per second. Designed for clients wanting to offer custom putter fitting services. Quintic Ball Roll v3.4 System – Specialises in the performance of both the golf club and ball throughout impact and captures at 360 frames per second. Ideal for both custom putter fitting and putting coaching services. Quintic Ball Roll v4.4 System – Specialises in the performance of both the golf club and ball throughout impact and captures at 720 frames per second. Ideal for both specialist custom putter fitting and putting coaching services. "At the inception of SIK Golf in 2009, I reached out to Quintic to test the technology we developed for the face of our putters. I chose Quintic because it had the most accurate parameters, for both the ball and the putter, of any other system on the market. Quintic administered a series of robot tests proving that our technology worked, which ultimately led to our Patented DLT (Descending Loft Technology). Perhaps an under-looked advantage of the Quintic Ball Roll System is that it is the only system to provide accurate metrics of the golf ball and putter without the need for adding any weight to the club to capture this data. I ultimately ended up purchasing a Quintic Ball Roll System to continue our in house R&D and while we still research and validate our new putter development, the Quintic has been used daily for our fitting and coaching sessions. Quintic is the system we trust to help some of the best players in the world! We would not be able to do what we do without it." "In an effort to provide the best facilities anywhere in the UK, we wanted nothing but the best tech here at The Newmachar Golf Performance Centre, and in Quintic Ball Roll v4.4 we have that. I have been a fan of Dr Paul Hurrion's work and research for many many years now and would not choose anything else when it comes to collecting data on putting. To have this much accurate data on both golf ball and putter using this camera based tech, means I can provide the best information to my students with confidence, allowing us to enhance our reputation as the leaders in the area when it comes to finding the truth. Any problems we have come across have been swiftly dealt with by the support staff at Quintic, they are very helpful." "I've been using Quintic to fit putters and coach for over 4 years and it still blows my mind when I see the data on the ball roll and putting stroke. To be able to capture and monitor vital details of the putting stroke and ball roll allows me to fit putters with an accuracy that I don't believe is available with any other software on the market. The ability to pinpoint small yet important flaws in a players stroke, then make changes to either the putter or the players technique whilst instantly monitoring the effects of the change make my coaching both informative and highly effective. Quintic is simply the best putting software available and was therefore the only option for me when I built my studio." "The Quintic Ball Roll system has added a whole new dimension to our coaching academy. The ability to analyse the golfer’s putting stroke mechanics and golf ball roll is the perfect combination. Our students have been blown away by the amount of data presented and have all walked away with a clear understanding of how to improve their putting moving forward. The information presented is invaluable to both the coach and player. We strive to have the latest industry leading technology at Michael McGivern Golf and Quintic Ball Roll fits in perfectly with our academy philosophy of ‘why guess what you can measure’. Paul and his team have been a joy to work with and are always readily available to answer any questions. For anyone wanting to take their putting seriously, a session on Quintic Ball Roll is a must." "Quintic allows me to coach with confidence and base my recommendations on the facts. Clients can see for themselves how a change in technique or change in putter specification can have a positive effect on club delivery and the all important ball-roll performance. I specialise in coaching putting and having Quintic has added to my business both in terms of increased coaching revenue and putter sales." "The Quintic v4.4 Research Software with its amazing new 1080fps camera is a fantastic addition to our putting analysis service. The upgraded software has enabled us to obtain even more valuable data from each putt. This allows us to offer a more in depth analysis of our customers putting technique. The Path feature has helped to understand how different styles of putter can affect the ball roll, which means we can fit customers to the putter style that most suits them. At the same time, the new software gives us the flexibility to either optimise a customers’ existing putter or suggest a replacement putter which is more suitable. Core Golf prides itself on the quality of its putter fittings, so it was vital for us to get this upgrade, in order to continue to provide the best service to our customers. We would highly recommend the Quintic v4.4 Research System to fellow Quintic Ball Roll centres, who are serious about giving the customer the best putting analysis possible." "The Quintic Ball Roll system is the gold standard for putting analysis. Along with the vast amount of information it also validates our Evnroll putter face technology. The 'impact ratio' data shows how the Evnroll imparts a constant energy transfer across the hitting area of the putter face, superior to all other putters. The Quintic has become an essential selling tool for our studio custom fitting service. Quintic Ball Roll is a wonderful piece of equipment." "When setting up my new state of the art iGolf Studio facility in Sheffield, it was imperative that we had the leading technology in order to provide clients with exceptional experiences and service. The Quintic Ball Roll System provides us with all the statistics and information we need to understand what is happening with the putter and golf ball at impact, enabling us to recommend the ideal putter for the clients technique... 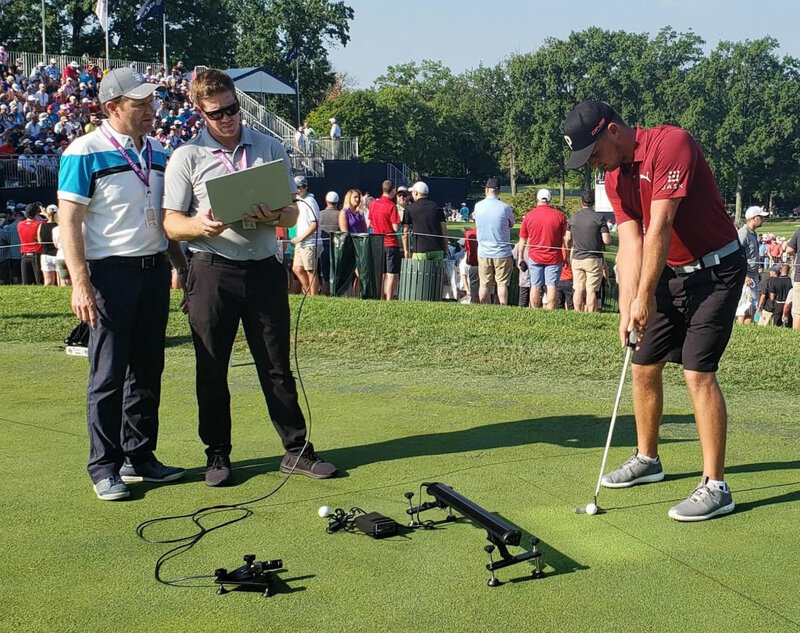 In addition to this, as the Quintic Ball Roll System provides all the information we need to help clients improve their performance on the greens, the QBR System is also instrumental in our putting lessons. I would recommend a Quintic Ball Roll System to any fitting and teaching centre wanting to improve customer satisfaction and retention." "The NEW Quintic Ball Roll v4.4 software is an essential tool for any dedicated coach looking to provide comprehensive, accurate data in a timely manner as it relates to putting performance. The data is well-organized in its presentation, allowing both the coach and student to gain a clear picture of the putting stroke and ball roll characteristics surrounding pre-Impact, impact, and post impact, measuring and highlighting the parameters from both the putter and golf ball launch conditions. From there, the coaches can develop a plan for efficient use of practice time, and use the software to test the effectiveness of the drills being used to improve skill level in the priority areas. Furthermore, the education and support given by the Quintic Team sets them apart from many other technology companies we’ve experienced in our time coaching. Their commitment and dedication to make sure the smallest of details are taken care of and that the system performs brilliantly, makes the Quintic Ball Roll v4.4 an intelligent choice for any dedicated coach looking for the best." "At Modern Golf, we sold more putters in the first month using the Quintic Ball Roll software than we did in the entire previous year. It is so fast and easy to use, and gives you the results needed instantly. It completely verifies which putter is right for each customer." "Quintic Ball Roll is the equivalent of 'Trackman' for Putting... It tells me the speed, spin and launch conditions of the ball as it leaves the putter face. The data is vital for checking my stroke mechanics, it is an invaluable piece of equipment at The Academy." "As a specialist in putting, the comprehensive data provided by the Quintic Ball Roll allows my technical beliefs and philosophies to be backed up by evidence. The advantages of the Ball Roll over it's competitors are profound. Firstly, with no devices added to the putter itself, the characteristics of the putter remain the same. Secondly, no other software provides as detailed data about the ball, arguably the most important data to know. With continuing support and updates to the software, there is no other choice to make when it comes to putting analysis software." "The Quintic Ball Roll Analysis Software provides unique data on how your golf ball reacts after impact. This information is invaluable when custom fitting your putter or improving the dynamics of your putting stroke." "The Quintic Ball Roll system is an essential central feature of the Putting Studio at our National Performance Centre for England Squad training here at Woodhall Spa. This state of the art analysis equipment and technical support we've received from Paul Hurrion and his team allows our England Coaches to make coaching interventions based on the digitalised facts generated from the collision between club and ball. Basing opinions on information received by the naked eye is no longer enough in the world of elite performance when accurate data can be captured so fluently and effortlessly. Not only does Quintic provide the starting point on the journey to world class putting, repeated data capture and analysis also benchmarks improvement along the way, providing evidence for player and coach alike that changes and hard work are having a positive effect. The confidence this gives players can't be purchased elsewhere."